please fill out our Robertshaw Parts Form HERE! The ROBERTSHAW Level-Lance Model 5400A is a microprocessor based, multi-point On-Off capacitance type level detection system. Utilizing the Pulse Frequency Modulation (PFM) method of signal transmission ensures that accuracy, repeatability and longevity are enhanced over level systems using conventional analog transmission schemes. The PFM transmitter, normally mounted directly on the sensing probe, requires no calibration or adjustments of any kind. The control unit can be mounted up to one mile from the PFM transmitter without requiring any special type of interconnecting wire or cable. Two wires are all that is required. The PFM transmitter does not require any primary power because it receives its operating power from the control unit over the same two wires used to transmit the level signal. The PFM (Pulse Frequency Modulation) transmitter is also designed to provide electrostatic protection at the probe input. It transmits a frequency modulated pulse signal to the microprocessor based control unit. The variation in the frequency of the pulse is proportional to the product level on the sensing probe. The microprocessor in the control unit receives the pulse and processes it to extract the level information. The microprocessor then compares this level information to the “AUTO-SET” calibration data stored in the non-volatile memory. When the level data coincides with this previously stored data, the appropriate output relay is either activated or deactivated, to give the desired control action. The total system design has been optimized to yield the highest possible levels of both EMI and RFI rejection. 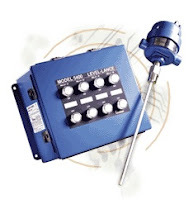 The Model 5400A Level-Lance is calibrated by means of the “AUTO-SET” feature. This feature permits all calibration of the unit to be done by the simple act of pushing a button. The Model 5400A Level-Lance is designed with plug-in type relay output modules to allow for easy configuration changes. Relay outputs can be added or removed in the field by the user. The control unit has the capability of having up to four relay output modules installed. The PFM input is optically coupled for better noise immunity. A) Fixed minimum or adjustable differential (deadband). B) High or Low level fail safe. 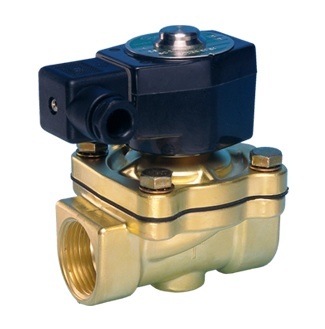 These selections are made by means of miniature selector switches located on the individual relay output modules. All relay output module functions are totally independent of other relay output modules. alternated or rotated to prolong their life. Two (2) wires, twisted pair in grounded metal conduit or twisted, shielded pair in non-metallic conduit. Buy Barksdale Explosion Proof Switches HERE! 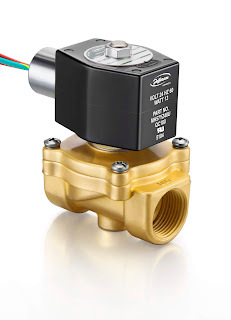 Barksdale's L1X, T1X & T2X Series Temperature Switches provide unmatched performance, quality & reliability in a mechanical thermostat - a safe solution for hazardous locations. The Barksdale single set point L1X & T1X and the Barksdale dual set point T2X, can switch, measure & control temperatures from 50° to 650°F (-45° to 343°C), and meets Class 1, Div. 1 & 2 hazardous location requirements. The optional adjustable differential provides precise control. 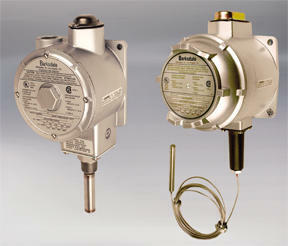 These Barksdale switches can be mounted locally for control directly at the source or remotely up to 25 feet. The Barksdale L1X, T1X & T2X Series are electrically rated for 10 amps @ 125/250 VAC & 3 amps @ 480 VAC. Standard 3 & 6 pin terminal strips simplify installation. The Barksdale L1X, T1X & T2X Series are rated NEMA 4, 7 & 9 and incorporate stainless steel temperature sensors to handle a wide range of media. Optional thermowells allow the sensor to work in pressurized vessels to 5000 psi. The Barksdale L1X, T1X & T2X Series are UL listed & CSA approved & ATEX Certified for hazardous zones within the European Community. Switch: One (1) single pole double throw (SPDT) circuit. Electrical: All models incorporate Underwriters?? Laboratories, Inc. and CSA listed single pole double throw snap-action switching elements. Switches may be wired normally open or normally closed. Bulb & Capillary: 6 and 12 foot length standard. Temperature Range: -50 to 650º F.
Standard Options: Thermowels, split nuts and union connections. Weight: Single - approximate 3.0 lbs. Dual - approximate 7.0 lbs. Dual - approximate 7.0 lbs. Approvals: Underwriters’ Laboratories, Inc. and Canadian Standard Assoc. are listed under Temperature indicating and regulating equipment, for use in hazardous locations, Class I, Groups B, C and D; Class II, Groups E, F and G.
Lubricated air, hot air dry air, etc.